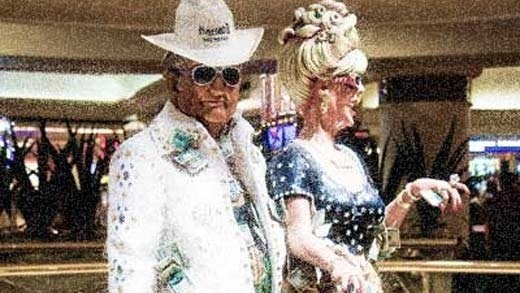 Is Las Vegas One Big Con? Okay, we all know that cities develop personalities. Los Angeles is good-looking but shallow. Chicago is stylish and knows all the best restaurants. Tokyo has toys you've never seen before, but can't live without. Portland, OR, invites you over to read comics in the basement. Springfield, MO, will bring the truck around to help you move. Kansas City, KS, values a good education and doesn't mind if you smoke a little. Negril, Jamaica will take you to the best parties if you buy the drinks. When I first visited Las Vegas, I figured it out immediately. Las Vegas has lifts in its shoes, starch in its oversized collar, a big fake grin and a prominent wad of bills poking out of its suit pocket. Las Vegas has a bridge to sell you, a bet you can't lose. It will give you a hundred bucks if you can just guess which cup the coin is under. Las Vegas is a con man. I knew an actual con man once, or maybe a better way to say it would be "pathological liar." He came into my life when I was 19 or so, stayed for three weeks, then left with hundreds of my dollars and the trust of several of my friends. It took a long time to repair those damaged relationships. I moved to Las Vegas in summer 2005. Like a lot of people, I moved for the opportunity. The city was booming more than any other in the country. My opinion changed. Las Vegas wasn't a con man. Las Vegas was a streetwise hustler, who got up early and stayed up late, always on the lookout for the next deal. Education didn't matter here, or family, or experience. The only thing was to stay sharp, to make those connections, to find the bargains and sell high. All you needed was energy, and the whole world would open up. Most of the people I met were making a lot of money. This con man that I knew, he was so much fun to be around. He would never sit still and watch TV, he was too addicted to people for that. He could walk up to any stranger and turn them into a friend. For a shy midwestern kid like me, being around him was like going to school. Instead of watching the pretty girls walk by, like me, he would charge. "Hi," he'd say, and then branch out into spontaneous comments about the way they were dressed, or where they were going, or what we were up to that night that required their presence. He was fearless. I would hang back, planning a conversation, and at about the time I got my courage up to speak he would come back with phone numbers and promises. I was in awe. I never saw anyone react to him with anything less than good humor. 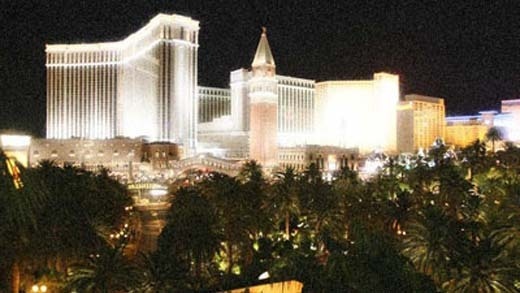 Las Vegas crashed with the rest of the country in 2008, and its character changed again. Visitors couldn't see the difference, but I could. They still saw huge crowds of pedestrians, long lines at the bars, and forty dollar charges to enter the nightclubs. I saw the housekeepers losing jobs, the cocktail waitress complaining of their half-sized tips, and the traffic on The Strip lightening up until I could actually drive on it. You know business is bad when you can drive from Flamingo to Tropicana on Las Vegas Boulevard in less than ten minutes. I had been conned. It wasn't a city of opportunity. Las Vegas, always a high roller, had become the high roller after a hard day of losing: Still genial, still good company, still grinning from ear to ear and tipping the bartenders, but furiously calculating percentages and opportunities on the inside. Las Vegas had changed its tune. The con man, in the three weeks that I knew him, got onto thin ice a couple of times with the tales that he told. In those moments, he would generate a more complex story on the spot to escape. By the end, he had become the son of a mafia don, a close affiliate of the Yakuza. He was an expert in hand-to-hand and weaponed combat, a fluent speaker of Japanese, and a hunted man. He possessed three sports cars and several million dollars, though he was unable to claim them at the moment. The last time I saw him, he was riding off on a city bus with three hundred of my dollars, to pay the filing fee that would enable him to reclaim his very profitable donut shop. So I was clearly very naive, yes, and too trusting. And I shouldn't have believed that someone who had to borrow money to eat at Jack-in-the-Box was a mafia prince. And that he had the ability to beat up four thugs empty-handed. And that he had to be on guard against snipers. And maybe I shouldn't have moved to Las Vegas, where millions awaited anyone with the courage and resources to invest in a house. And where if you kept dropping in quarters, you could win all your money back. And where the girls are so lonely, they paste billboard-sized photographs of themselves on the sides of trucks, posing in lingerie under their phone numbers. But here's the thing. The con man told me that if I loaned him money to reclaim his donut shop, I would be part owner of it. It had never occured to me that I could run a business. Long after he was out of my life, I started and still operate several profitable businesses. And the con man showed me that all I needed to win a heart was to take the first step. Years later, I married a girl that I never would have had the courage to pursue without that confidence. And the con man told wonderful stories, stories that I still tell to other people. He was always entertaining. It looks like maybe we're not all going to make millions in Las Vegas real estate, or hit the highest progressive jackpot, or take our high-school educations to hundred-thousand dollar jobs. We've been conned. But if Las Vegas is a con man, he's a charming con man, one that gives you free drinks with a smile, and lets you see the pirates without paying a cent. If you don't want to gamble, you're still welcome to stay and check out the fountains and sit down for a while. Las Vegas will never get mad at you for seeing through its tricks, complaining about the heat, or talking bad about it on the internet. It's just going to keep on being Las Vegas. I've heard tourists say: "I know I'm just going to lose my money. But it's totally worth it. I'm enjoying myself so much!"